The history at Le Bernardin is just as rich as the food is. 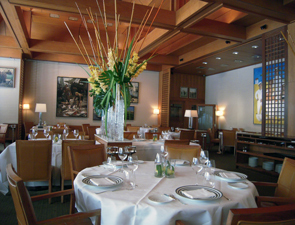 Gilbert and Maguy Le Coze opened the original and much smaller Le Bernardin in Paris in 1972. By 1976, Michelin had granted the brother-and-sister-owned restaurant one star and by 1982 the siblings had relocated within Paris and earned their second Michelin star. Over time, their clientele became more and more American, the sign of an American invasion that inspired Maguy to open a second restaurant in New York City. The concept was unique and by January 1986 -- when the Le Coze siblings opened Le Bernardin in Midtown Manhattan -- it was a reality. Gilbert became the first chef to buy directly from the Fulton Fish Market, as he wanted to serve only the freshest of American fish. His decision to buy from the market paid off and earned the restaurant four (unheard of!) stars from The New York Times, right out of the gate! Maguy continued working in Paris while Gilbert toiled away in New York, preparing unusual and delicate seafood creations. 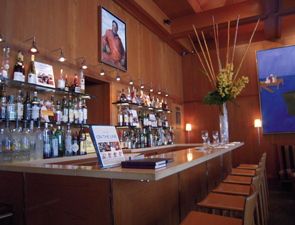 By the end of 1986, however, Gilbert and Maguy had sold their Parisian restaurant to Guy Savoy. Then, in 1994, tragedy struck when Gilbert passed away at the young age of 48. Out of tragedy, a star was born. Eric Ripert, the chef at Le Bernardin, was suddenly thrust into the spotlight. After several years of working with Maguy as executive chef, earning her trust and helping her build the restaurant, he became co-owner. Now, whenever in-the-know foodies talk about "the best restaurants in New York," Le Bernardin is at the tip of their tongues. Once inside the world of Le Bernardin, it's hard to imagine that it is located in the heart of Midtown, which is home to media powerhouses, high-profile financial institutions and New York's lively theater district. Still, it's the perfect location. After entering from a tree-lined stretch of West 51st Street, one is transported into a calming environment where the cuisine is the star of the show. Outside, an elegant brass and glass canopy stretches from the entryway to the edge of the sidewalk, with the name "Le Bernardin" emblazoned on both sides, your first indication you've arrived. Just as functional as it is attractive, the structure provides shelter if it happens to be raining, so if you arrive at the door by car or taxi you won't even need to open your umbrella. Foliage adds a special touch on either side of the awning, where elegant trees and two copper urns with delicate green foliage serve as decoration. Directly past the awning are two sets of three smaller golden colored canopies hanging over large flower boxes that are filled with lush green foliage. Not only are these decorative, but they also provide shade inside from the harsh sun that beats down on the windows into the dining room, thus enhancing diners' experience by filtering sunlight before it makes its way into the restaurant. Directly past the two sets of shades is a separate entrance to the Salon, Le Bernardin's private dining area.